While it has spawned a range of ferociously sporty Evolution editions, Mitsubishi's original mid-size saloon Lancer didn’t exactly set the UK car buying market on fire at first. However, the Lancer has reliability and affordability on its side for the budget-conscious consumer. Late eighties Lancers came with a 68bhp 1.3-litre, a 74bhp 1.5-litre or a 123bhp 1.6-litre 16v GTi petrol engine, the last upgraded to a 1.8-litre and 134bhp in 1990. There was an additional 4-wheel-drive variant, a 95bhp 1.8-litre GLXi. Two body styles were offered, a four-door saloon or five-door hatchback. The 2005-2007 Lancer came with 1.6-litre Equippe and Elegance editions and a 2.0-litre Sport for a maximum of 133bhp and a choice of saloon or estate shapes. The 2008 Lancer was a great improvement on previous versions and started to become more popular. The most recent models may look ordinary, but they are family friendly and fun to drive. Standard equipment for a second-hand Lancer is pretty good. Early editions had a fairly cramped cabin but later Lancers are sufficiently more roomy. 2005-2007's ninth generation came with 15-inch alloys, air conditioning, metallic paint, keyless entry, CD stereo, body-coloured wing mirrors with electrically controlled heating and adjustments, body coloured spoiler, front fog lamps and a height adjustable driver's seat. The range-topping Sport edition boasted larger, 16-inch alloys, a leather-trimmed Momo three-spoke steering wheel, sports seats, CD auto changer, lower suspension and a racier grille. Styling is neat but rather dull, while the whole thing is of a good enough quality to comfort rather than inspire. ABS and EBD come as standard. The next generation had trim levels comprised of GS1, GS2, GS3 and GS4. All came with various bits and pieces. It's a lot of car for the money, and you get more equipment the more modern you go. A used Mitsubishi Lancer isn't a bad drive. Steering is responsive and the suspension is firm and stable. It's an unexpectedly enjoyable and inspiring drive from an unexciting looking car. Generous equipment levels are a standout feature along with low running costs, so it’s a pretty good car all round. 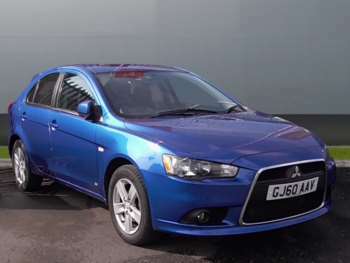 Got a specific Mitsubishi Lancer model in mind?